Today, i recorded vocal tracks on an electro disco song with Neumann U-87 Stephan Paul mod. Without eqs, it already stood out in the mix!! I've been into recording mode for a few weeks. Today, I did a vocal and guitar recording with a Japanese condenser mic, Sanken CU-41 with pre amps and comp which all my recording engineer brought. These i never tried before. but, the sounds should sound like recorded in a luxury studio. we also made recordings of a nylon strings guitar by the same mic, which i felt great to play with. i usually record things by myself, but it is very pleasure and luxury to have a staff record things. 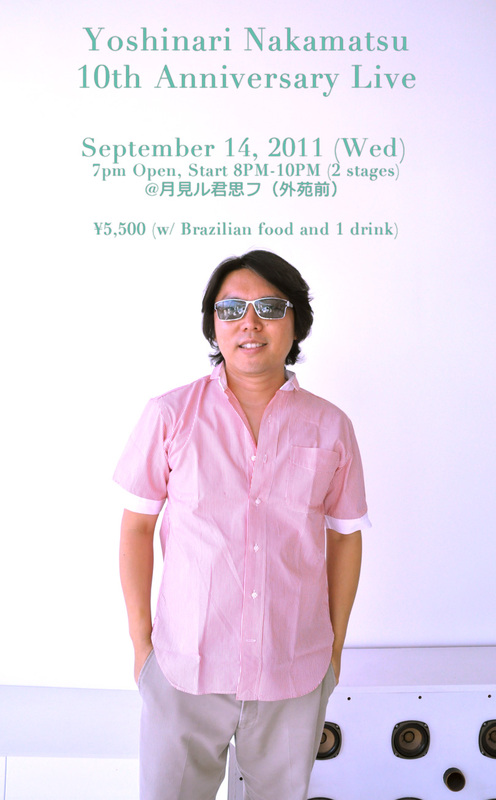 I will be doing recordings even after my up coming gig on September 14 in Tokyo. always anything contains learning part, but i learned "that mic" will capture such high frequency. very impressive and wish i could the mic for my other songs. An internet radio show "Cafe De Yoshi" ( Vol. 189) will play a special mix by Yoshi, da host. The mix consists of Bossa Nova, Jazz, African, etc, very slow warm music with a certain spice! I have noticed myself that I changed the way I make tracks / compose songs since a year ago. I have been a guitarist and and it is my main instrument, but for recordings, I play others like bass and synth. When I made the song "Cart," I believe I started from Kawaii K-1 II vintage synth (is 1989 already called vintage???). There are a few sounds I have linked in K-1 II and still use it. But, I used to recorded guitar at first on most of songs. Specially, when I wrote a riff and do the rest part while recording on soft ware, Logic. But, I never ever used the score function too much until I worked with classical players who cannot play by chords. It was hectic since I was not familiar to use the function in Logic, but it was very educational. These days, I have recorded some of the songs I wrote long time ago. Before I recorded guitar and vocal, I just used the soft samplers in Logic and programmed the vocal part and chords by acoustic piano. it really really gave me a fresh way to look at the song and gives me a better whole picture of the song. With Midis/software instruments, I can easily transpose, change the tempo and change to other instruments. I came from a rock band and really liked organic groove and loved to play bass. But, now, I even program the bass part but include my emotion and knowledge as a musician. As I mentioned from the last blog, I was very old school and spoiled to analog way to create music and never accepted much of digital tool as I do now. Partially, software instruments sound amazing and not too expensive at all. Partially, it is my new phase to do something different to me, maybe not to the others. Going back to the issue of using piano as a tool to sketch a big picture of a song, it actually did not end up as a temporary drawing, it has become a part of my powerful instrument in tracks. You may hear alot of piano by Ivory II on my recent track, Eternal Light. I am always between players mind and engineer mind, software and hardware. Sometimes I have no desire to buy things and suddenly i get new desires to try out new and old things i never try before. sometimes, i am in a mood and the other time i am totally opposite. i believed in analog world but at this moment, i am seeking and facing to the digital world of today. not until recently (old school 16/44.1), I started using 24 bit / 48khz, it's changing. i am in more hi-fi mode. I used to like very dry sound, no reverb on vocal, during early 2000.
but now, i am dying to use alot of reverb for many instruments. Not only reverb, but i may also add delay for vocal and guitar on gig. Yes, I like delay and the Edge (laugh), but I never ever thought of using it for cafe bossa yoshi world. own solo concert on September 14 (wed) at Gaienmae, 1 stop from Omotesandou. My own solo project sounds acoustic, bossa nova, reggae, resort music, and some times disco. I sing mainly in English and play my songs. electric guitars. all the back ground instruments and photos are made by myself. It is a nice big cozy atmosphere. good to visit the club. I will play my guitars so hard as rock'n roll!! light, there is "Ski Shop Jiro" at the corner and take right. there is a moon sign on the right, the place is in the basement.